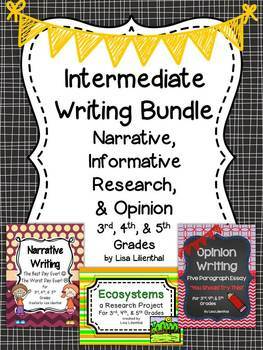 Common Core Writing: With his bundle of three intermediate writing packets students will learn informative writing and research, narrative writing, and opinion writing. 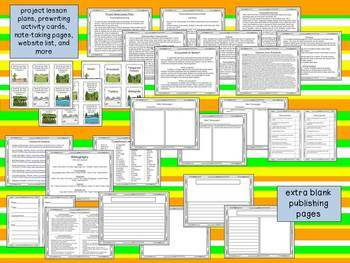 Each complete project will help guide your students through the writing process. Students will love these fun and engaging writing projects that meet Common Core Standards! With this narrative writing packet students will enjoy writing real or imaginary stories about their best day ever or their worst day ever. 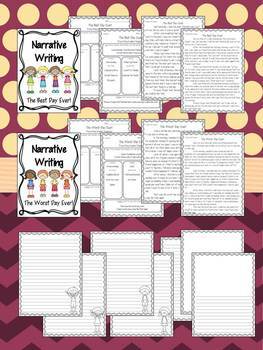 This opinion writing unit will guide students through writing a five paragraph essay. Students will state their opinions about an activity or hobby that they enjoy and give reasons, details, and examples why others might want to try the activity. With this informative writing research project students will research and write about different ecosystems or biomes. Then they'll create an ecosystem report booklet to share! Personal Narrative Writing ~ Lend a Hand!